Most colleges require or prefer a report that includes all test scores. Before recommending the use of Score Choice, check with a student’s prospective schools about his or her score requirements. A majority of colleges and universities require, or at least prefer, that all test scores be submitted with an applicant’s transcript. Some of these schools like to consider the progress represented by a complete report of all scores, but most choose to “superscore” the tests by cherry-picking the best individual math, reading and writing score and combining them for a score that reflects the student’s best performance in each respective section. See “The Alexis example” for a representation of possible test scores. 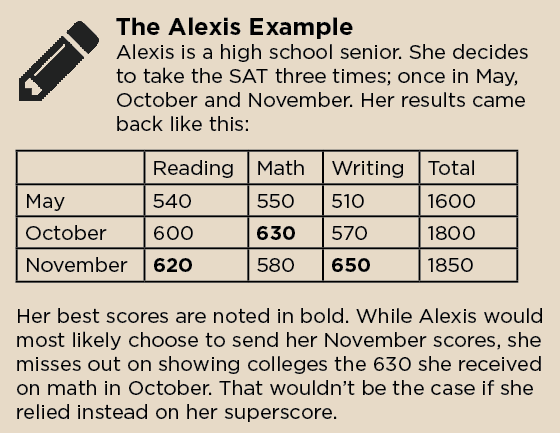 If Alexis selects Score Choice, she will undoubtedly submit her November test scores, but then colleges will never see her highest math score, a 630, in October. If Alexis doesn’t select Score Choice, an overwhelming majority of colleges will superscore her results, in which case admissions officers will be presented with a compilation of Alexis’s highest individual scores, resulting in a 1900 overall. (While superscoring may seem like an act of benevolence on the college’s part, it’s actually a self-serving policy that boosts the average test scores of the incoming freshman class, a statistic used for marketing the university). Score Choice can be costly. While test anxiety reduction was the stated intent of the program, Score Choice was actually enacted by the College Board to compete with the ACT’s score reporting policy. It provided another benefit to the College Board as well: additional revenue. When registering for the SAT, students can elect to send score reports to up to four colleges with no additional charge. But if a student decides to take advantage of Score Choice, then these free reports are forfeited, as students will have to wait three weeks to see their results and then pay for the chosen scores to be sent to colleges. For some, this additional cost may be prohibitive. Fortunately, College Board explains the score reporting policies of most schools during registration for the SAT so that students can make an informed decision. So if Alexis is planning to apply to University of North Carolina, which accepts Score Choice but considers the highest section scores from all SAT dates, she can weigh her financial and academic options and decide whether or not to take advantage of Score Choice’s selective reporting. But if she’s applying to any of the schools in the University of California system, she will be alerted during test registration that all test scores are required, in which case she may as well have her results sent for free immediately after the test. The Common Application may become more complicated. The final issue with Score Choice is that it muddles the Common Application, an instrument that was intended to simplify the application process. In Alexis’s case, she would have to choose either to leave the test score field blank on the application, or to complete two Common Applications — one with all test scores listed, and another with just her Score Choice results provided. If Alexis chooses to leave a field blank, she should also be sure that none of her prospective schools require that this field be completed. Most test preparation and admissions experts suggest that students submit all SAT scores to all prospective colleges. Obviously, each student’s results are unique, and each college determines its own specific score reporting policy. PowerScore Test Preparation recommends that students research these policies prior to registration for the SAT so that they can make an informed decision about Score Choice. In some instances, the program may bolster a student’s performance, but it more often detracts from results and complicates the application process. The ACT has always allowed students to select specific scores to submit to colleges. At this time, most colleges view ACT scores as a composite, but with the introduction of the SAT Score Choice program, many started to superscore ACT results as well so that their policies for the two tests were equal. As with the SAT, students and counselors should research college score reporting requirements for the ACT. Victoria Wood is the Director of SAT and ACT Development at PowerScore Test Preparation. With over 20 years experience in education and test preparation, she has assisted thousands of high school and college students in exceeding their standardized testing goals. She is the author and co-author of many acclaimed PowerScore publications, including the “SAT Bible Trilogy” and “SAT Essential Flash Cards.” You can find these books and many free test prep resources at powerscore.com.